This was the first year that we’d ever watched the FIFA World Cup, and we wouldn’t have watched so many matches if it hadn’t been for the Internet. We only have basic cable for the office and none of the extra sports packages, so if we wanted to watch anything that we couldn’t pull off the air, we had to find it online. Fortunately for us, all of the matches were available live on ESPN3.com! The matches were not some cheesy broadcast like those of local cable channels with a single camera angle, low production values, and awful sound. 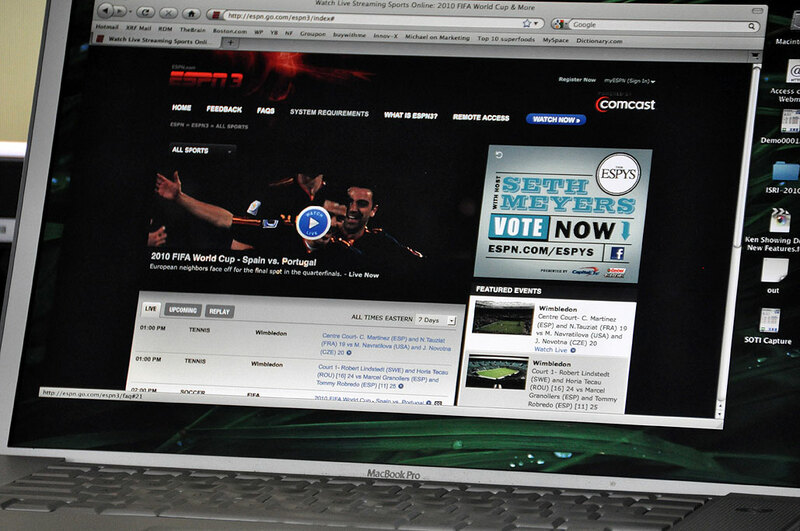 The ESPN web broadcasts and commentaries rivaled those of the major networks on prime time. Watching a sports event on the computer is OK, but it does not compare with watching it on a big screen. The ideal situation would be to take the game being streamed to our computer and display it on the 46″ LCD screen. When TVs were analog, this was a cumbersome digital to analog conversion process involving A/D boards and various cables. 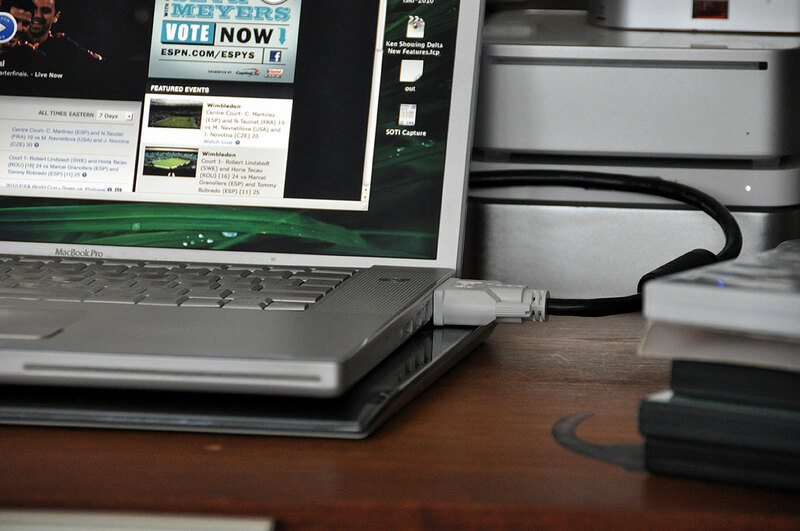 Since the digital TV conversion, all of the new TVs can directly handle video output from a computer. All we have to do now to see the game on a larger screen is to connect the “video out” from a laptop to our LCD TV using a DVI cable. The images we see on the big TV screen are every bit as crisp and sharp as that of the laptop, just really really BIG 🙂 Since our Apple laptop supports dual screens, we could still do some work (downloading updates, etc…) while using it to watch the game. Of course, there are always a few glitches to using the Internet to watch a live TV program. While the experience is often as good as watching a program from a cable/ satellite/off-the-air signal, the Internet broadcast can be much choppier and prone to signal loss. This is inherent in the way the Internet was designed, which was to ensure signal integrity, not constant signal delivery. This means that while there may be signal corruption or loss during transmission, the redundancy designed into the transmission protocols ensures that a complete signal can eventually be reconstructed. While this is great for data transmission where the entire package can be reassembled once all the bits eventually get to the destination, it can be problematic for the flow of a TV broadcast. Still, with new buffering technology and signal compression, we were VERY impressed with ESPN3’s overall signal stability and quality through out its World Cup coverage. We can see that we will be watching more and more of our sports this way as the range of coverage available via the Internet is just so much broader. We did watch the finals of the World Cup on ABC, but we pulled the signal off-the-air instead of via our cable box because it was cleaner and sharper. More and more of the traditional TV content is now available on the Web. Much of the content available via the traditional providers for a fee are available on the Web for free. Viewers are no longer restricted to the TV for their sports and entertainment, as the content may now be consumed on any display (TVs, laptops, iPads) convenient for the viewer. Hulu and Netflix are building their future with on-demand subscriptions to TV shows and movies. What does this all mean? It is telling us that unless cable and satellite TV can offer more value to their customers and soon, their days are numbered.